To travel, immigrate, work or study abroad, you may face many confusions and hurdles before you reach your goal. What programs can you apply for immigration, application status, processing fees, medical policies and many more never ending questions may arise in your mind. Here we have a list of 40 immigration bloggers who can definitely help you to immigrate and follow the rules of the particular country you decide to go. We share their details and you can definitely chase your dreams through them. The CEO of Lippes Mathias Wexler Friedman LLP who focuses mainly in two areas like family businesses and working with entrepreneurs. He has written numerous articles and five books on Family business and Positive Psychology: New Planning strategies for the 21st century. He is one the best immigration bloggers who works as Founding Advisor of Next Gen Advisors LLC besides his legal advice to help families and their businesses by implementing different cutting edge strategies from positive psychology. He has won various awards for being the best Lawyer in America. To live, work, settle or study in Australia, contact Anna Maria Alba, an Australian Registered Migration Consultant and blogger to get the right information and advice based on present legislation. Approaching the best and correct person is half way done and Anna Maria helps in career counseling, IELTS exam preparation and job search guidance too. Immigration Lawyer by profession based in Los Angeles, California to help immigrants to get visas to the United States. His blogs help every individual who are seeking a settled life in the USA with the right immigration rules and advices. His recent blog on ‘How to get citizenship by investment in the United States: Step-by-Step’ unwinds every possible opportunities for immigration. Mr. Sean Hopwood is the President and CEO of Day Translations that focuses every translation services and also immigration services. He is the true reflection of hard work, formality, respect and professionalism. The latest blog on Day translations titled “7 guidelines on how to pass the Green card interview process” has helped many immigrants to achieve their goals. Mr Mark Krikorian is a nationally recognized master on immigration purposes and Executive Director of the Center for Immigration Studies since 1995. He has published various articles in outlets like The Wall Street Journal, The Washington Post, The New York Times based on his immense expertise in the immigration field. His recent publication is Open Immigration: Yea & Nay. An immigration attorney who has helped a lot of immigrants in need. He is the founder of The Law Offices of Grinberg & Segal, PLLC along with immigration attorney Eliza Grinberg to provide the customers with a law firm that is committed to protect their rights. 20 years experienced lady in immigration law right from giving advices to multinationals on global mobility strategy and helping immigration rules and policies to supporting investors from foreign nations, senior executives and entrepreneurs and their families to enter and settle in UK. Mr Cyrus Mehra is the Founder and MD of Cyrus D. Mehta & Partners, PLLC (CDMP). He focuses on family immigration, employment immigration, business immigration, consular matters, federal court litigation and asylum. He handles every problem with a best solution which is effective strategic and ethical to his clients. Get details on Cyrus D Mehta & Partners PLLC or reach him at [email protected]. Mr Steven Meurrens is Canadian Immigration Lawyer who focuses in Canadian immigration matters which includes skilled worker applications, provincial nominations, work permit applications sponsorship for spouses, residency and sponsorship appeals, business applications and judicial review applications at Federal court. Visit Steven Meurrens Canadian Immigration Lawyer or reach him at [email protected] for personal assistance. She is a passionate immigration lawyer and also famous for her blogs and speeches. She is the host of Tamina Talks Immigration, a talk show on South Asian radio station Desi 1250am. Tahmina is also popular for organizational advises and non-profits on immigration rules and policy issues. Mr Max Chaudhary is Toronto based immigration lawyer who is a Former Director of the Organization of Professional Immigration Consultants and also a Former Former Vice President, Ontario Chapter of the Canadian Association of Professional Immigration Consultants. He has been consulted by other Canadian Immigration Lawyers who face daunting challenges in immigration appeals, immigration cases and federal court cases. She is the Executive Director of the American Immigration Council. She focuses on offering genuine and fair justice for all immigrants under the laws. During her career, she has worked to support rights of noncitizens to make sure agencies for immigration never violate the laws of immigration. Get more details on Immigration Impact or email Beth directly at [email protected]. Mr. Charles Kuck is the founder and Managing Partner of Kuck | Baxter Immigration LLC. He assists employees and employers with professional visas and business visas, immigrant visas, international immigrant investors support, consular representation and citizenship matters. Being an active member of Federal Court practices who works for immigration issues, he has been a highly recommended immigration lawyer. Visit AILA for more details or reach him at [email protected] for personal suggestions and support. He is the executive Director of the American Immigration Lawyers Association, Washington. AILA is the association consisting of more than 15,000 immigration lawyers to support justice, offer improved immigration and nationality law and practice, advocate fair immigration law and policies etc. Know more details on AILA or ask for personal assistance at [email protected]. He is a Certified Specialist in Citizenship and Immigration Law and Refugee Protection. Mr Mario has taught various Immigration law sessions, and appears on media talks on breaking citizenship, refugee and immigration stories. He is quite experienced in handling thousands of file every year at each stage of client immigration processes. He is an independendt public policy consultant based in Washington. His blogs and papers on immigration laws, refugee and immigration stories are quite popular. He is also a contributing writer at National Review. Mr Ashwin Sharma practices U.S. Immigration and Entertainment Law. He represents clients from United States, hospital systems, Fortune 500 corporations, film actors, producers, directors, musicians to file immigration matters before USCIS, such as H-1B, L-1, E-2, E-3 work visas, employment petitions, marriage and family based green cards, fiancé petitions, answers to complex Requests for Evidence/queries and appeals. Visit Ashwin Sharma for details or reach him at [email protected]. Clare Cherkasky has three decades of experience in immigration law. She is also talented in handling uncontested divorces and wills. She has been graduated from the University of Wisconsin Law School. After graduation she started to practice in the Virginia, District of Columbia, and Texas, and the US District Courts for the Eastern District of Virginia and the District of Columbia. Visit her website Clare Cherkasky for details or reach her directly at [email protected]. She is a quite committed and devoted person to carryout immigration law practices. She has been a supporting hand to thousands of individuals and organizations to achieve their immigration objectives by offering reliable and efficient legal advices. Ms Sheila lectures by staying updated on the latest trends of immigration law at AILA conferences. Get more details on Law Offices of Sheila Starkey Hahn or contact her personally at [email protected]. Reach Ray Schey at [email protected] for any immigration matters and advices. He has 20+ years in advertising sales and sales management in television, radio and publishing. He is the founder of Law offices of Douglas R Penn LLC and is quite committed in practicing immigration law that includes PR and work visas in the US since 1997. Mr Douglas represents the immigration matters before the Immigration and Customs Enforcement, Citizenship and Immigration Services, the Department of State and the United States Department of Labor. Visit Law Office of Douglas R.Penn for more information or reach him at [email protected]. She has been contributing in the field of Immigration law since 2001 and an honored leader in the Twin Cities immigration Law community. Ms. Santra has worked for clients in immigration law areas like employment-based, family-based and deportation. Her works for the employment-based immigration focuses advanced degreed professionals in every field. Being experienced she advises multidimensional perspective clients that takes into account all accessible choices in immigration laws. Mr. Mo Goldman has served different American Immigration Lawyers Association’s (AILA) committees including annual conference committees and family law. He has lectured on various immigration subjects that helped many individuals who are seeking to get settled abroad, he has won AILA’s 2010 Joseph Minsky Young Lawyer Award for the major contributions in immigration and nationality law field. He is one of the best immigration blogger who provides one-on-one attention and tenacious representation that you need. He handles each legal aspect of your immigration case. He takes the time to get to know you and your case on a personal and detailed level. Visit Verma Law Firm for more information or reach him, directlat [email protected]. He is the founder of ORR immigration law firm and has 13 years of experience in U.S and worldwide immigration practices. For the contributions in the field of immigration law, he has received 2009 Joseph Minsky young Lawyer Award. Approaching Mr Allen will be definitely a good idea as he is one of the best immigration bloggers too and can guide the clients in a most appealing way. Visit Orr Immigration for details or email at [email protected]. She is the Associative Director of Government Relations at American Immigration Lawyers Association. Her recent blog on DISMANTLING THE “INVISIBLE WALL” AGAINST LEGAL IMMIGRATION, BRICK BY BRICK shares the best information regarding U.S immigration. She is the Director of McCandlish Holton immigration firm. Her main focuses are employment –based immigration especially healthcare sector, and also J-1 waiver and processing of green card for foreign medical graduates. She has published numerous articles in J-1 waivers and green card options. She is the managing partner of Berard Immigration law firm. A decade ago, she has left the high-coveted job to be in the legal world and she could be a winning immigration lawyer within no time by offering the services to thousands of clients around the world ranging endless industries. He has an experience of more than 40 years and has helped over 10,000 clients with legal issues. Being one of the best immigration bloggers too, he has a clear understanding to effectively communicate and translate terminology to provide the best advise you require. Steven Meurrens is a Vancouver based Canadian immigration lawyer who can advise clients for their Canadian immigration and green card issues. He represents individual and corporate clients in receiving their visas and entry permits for various business related purposes, Labour Market impact assessments, international trade agreements, change from temporary to permanent resident under various federal economic areas. Visit LAREE ROSENBERG or email at [email protected] for more details. He has started the award winning UK immigration, extradition, nationality and human rights law firm based in London. He has an expertise in the immigration field for more than 30 years by meeting migration needs of business individuals both internationally and locally to litigation in every UK jurisdictions and European court of Justice and European Court of Human Rights. Visit Gherson for more details. He has 11 years of experience as a Canadian immigration consultant and the found of Sterling Immigration Ltd. the firm has expanded to the UK, opening offices at London and Birmingham. The firm is one of the selected organizations in the world who works and licensed to work both British and Canadian immigration law. Otis Landerholm is the founder of Landerholm Immigration to assist people with navigating challenges in the U.S immigration laws. He enjoys learning languages and is proficient in many foreign languages so that people don’t find difficult in dealing with him. He has founded the award-winning Lightman Law firm. He has sound experience in immigration law and international matters regarding immigration. Lightman was elected as “Rising Star” Super Lawyer in the New York Metro area by SuperLawyers.com in 2014 and 2015 and as one of the Top 40 Under 40 Immigration Lawyers in New York State by The American Society of Legal Advocates in 2016. Joseph A Dougherty is the CEO, MD and Chairman of Buchanan Ingersoll & Rooney. He has expanded the firm’s readiness to address client requirements. He is keen at ensuring high quality legal services to clients with a best value. He is the experienced immigration lawyer represents clients in NC, Charlotte, GA, Atlanta, and all other immigration courts in the US. His main areas of practice are US immigration law and Naturalization law. Visit The Law Office of Mark J. Devine for more services and details. Mr Harun Kazmi is a member of American Immigration Lawyers Association (AILA), American Bar association and the San Deigo County Bar. 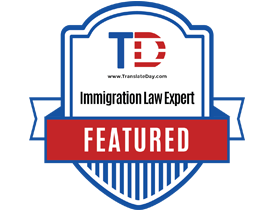 He has immense experience in immigration and Nationality law in San Deigo. He has helped out many clients for business related and family immigration related matters. He is the founder of The Lozano Law Firm, PLLC, an immigration law firm that serves in San Antonio, Laredo, Eagle Pass, and San Angelo in family-based and business based immigration law. He has helped lots of immigrants to achieve their dreams by finding legal solutions to their immigration issues. Laura Edgerton has 20 years of experience in immigration law with strong determination to ethics to keep the clients achieve their family or business related immigration issues. She is a Raleigh immigration lawyer who serves business, legal and immigration communities by solving employment of international personnel in the US related issues. TranslateDay provides Certified Translation Services for all kinds documents. It has been able build an untarnishable trust with their prompt and accurate interpretation. It has become a fast rising player in the translation industry. Transalate Day employes the most experienced translators to bring clients a thorough translation with a touch of expertise. Immigration Experts is one of the best Consultants in the world who works for both Australian and Canadian immigration. Mr Rizwan Ul Haque is the CEO of immigration Experts. He worked with world bank in the past. He has 10 years experience in skilled immigration. He is one of the best consultant in the world. Expert Opinion is a leading skilled based immigration consultancy firm in Pakistan. Team of expert consultants and immigration lawyers having demonstrated history in Skilled Immigration to Australia, Canada and New Zealand. I love this bucket list and you know you are right. Great share and thanks for mention here.